A Demand for Compliance is a legal document used to notify a tenant of their failure to pay rent or otherwise abide by the terms of their lease. It is frequently used when another letter such as a Notice to Pay Rent or Notice to Quit has already been sent. 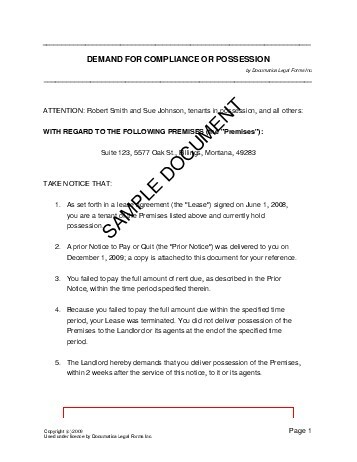 This letter demands that the tenant remedy the issue, or give up possession of the property to the Landlord, within a certain timeframe. As a result of this notice, is the Tenant's lease now terminated? We strongly recommend obtaining an attorney reviewed Demand For Compliance or Possession directly from us.